As I’ve said earlier, the 10 years I spent as a 7th and 8th grade Language Arts teacher guides my reading choices. In addition to simply liking the genre, I often I select YA books to see how they deal with particular issues in our society. This was one such book. Right now I’m undecided about this. Three stars is out of the question, two is being generous here. The rundown: Travis is bullied in school and ignored by his parents at home. Cutting himself with a razor blade is the one way he finds relief from his anguish and a way to control his pain. He becomes friends with a girl at school, Chyvonne, and eventually reveals his secret to her. Inspired by an unconventional teacher and his new friend, he eventually takes up the art of paper cutting as a way to avoid harming himself. 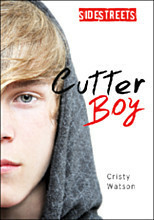 While I appreciate the author’s attempt to write a book about boys who self harm (an important subject that doesn’t get written about much) the ending seemed forced and terribly unfinished. The suggestion that art is a better form of therapy than cutting is suggested as a resolution here, but further details beyond this are left out. For such a large problem that cutting can be for a person, the resolution here just seemed too convenient, too simple. I am not a person who self harms, but I do know people who do. Pushing a piece of paper in front of them to cut instead of their bodies is an interesting prospect, but hardly a ‘solution’ to resolving the anger, pain, and depression that drives them to cut in the first place. I also did not like the way that the act of cutting was romanticized either. We don’t need to read about “beauty” swirling down the drain, or the smooth surface of a razor being “like ice, like glass” to understand what you’re referring to. These are tired, boring metaphors that don’t really portray cutting as the harmful action that it truly is. Like just...stop already. Character development is also lacking here, big time. Travis, Mom, Dad, Chyvonne, and “the twins” (Travis’ sisters) all seem to move about this story with no real solid sense of purpose. I still don’t feel like I know anyone any better than I did when I first started. For a book that aims to engage reluctant readers, this book succeeds, but that’s about it.